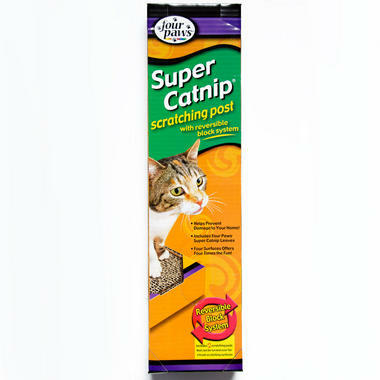 The Four Paws Cat Nip Scratch Post helps prevent Cats damaging furniture with their claws. This Scratch Post contains organically grown catnip to encourage your pet to use it. The Four Paws Cat Nip Scratch Post has a reversible block system to extend its life, and you can hang it from a door knob, place it against a wall or simply lay it flat on the floor. This scratching post helps promote good cat behaviour and helps prevent unwanted clawing of furniture.